On Friday, June 7th all twelve of us, including Professor Owens, awoke at RTC and then ventured down to the “lower” parking lot to meet Tsewang, Leki, and the bus at 9am. 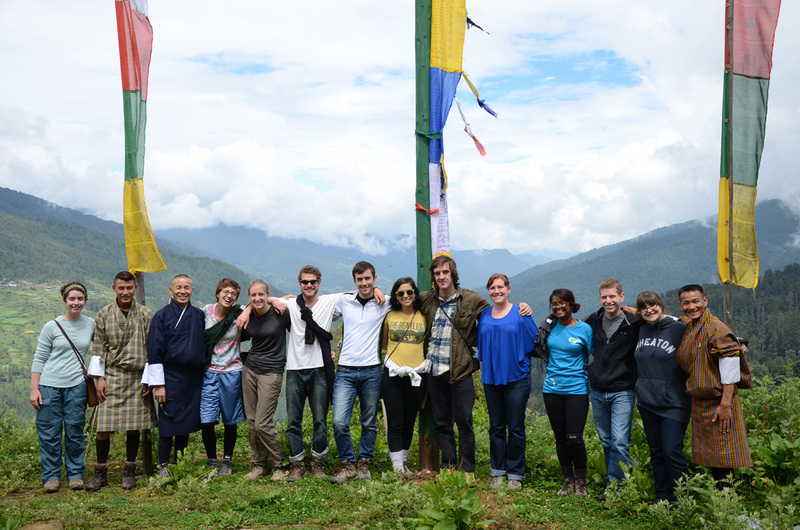 All of us waited with both eager anticipation and subtle sadness to begin the last long trip of our time here in Bhutan. It was also not lost on us that this would be our last guided experience with our dear friend Tsewang whom we have known since our plane touched down in Paro on day one. Our final destination on this day was the Dzongkag of Haa which is in the Northwestern-most corner of Bhutan and is Tsewang’s birthplace. The ride on the bus did not seem too long—certainly not as long as our trip to Bumthang—and we had our trusted driver, Leki. 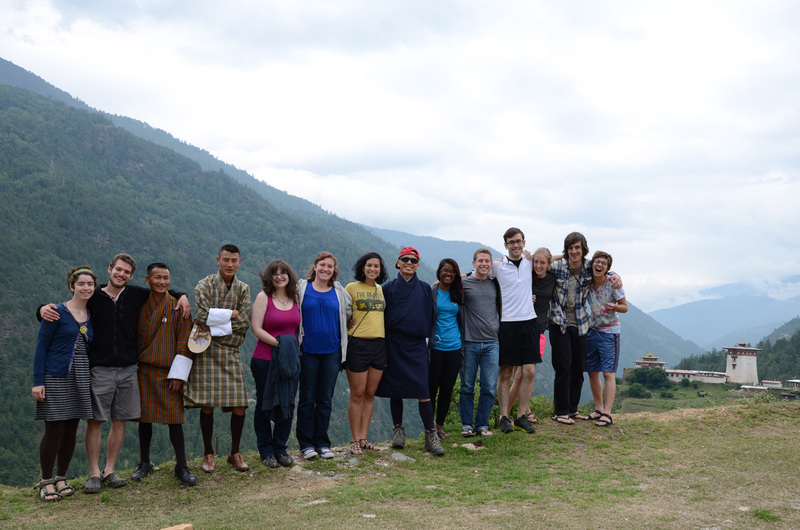 We arrived at a remote farmhouse that we soon learned was Tsewang’s childhood home. 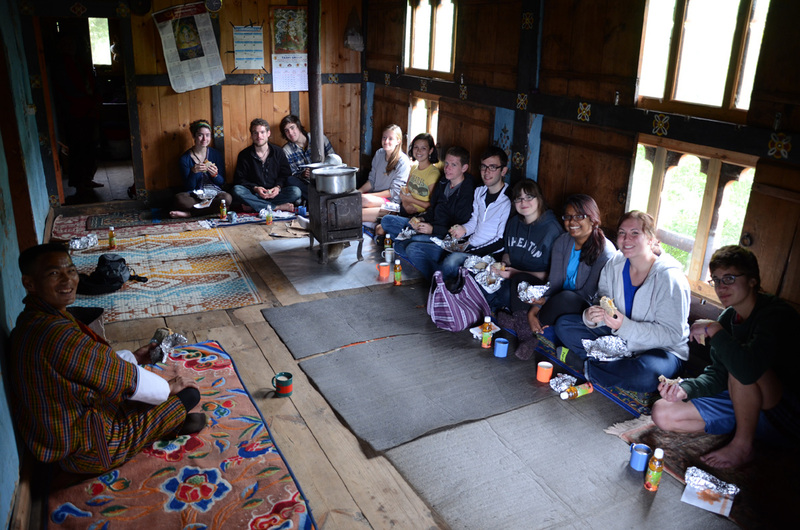 We were all welcomed with tea and lunch as we waited for our next mode of transportation to arrive. 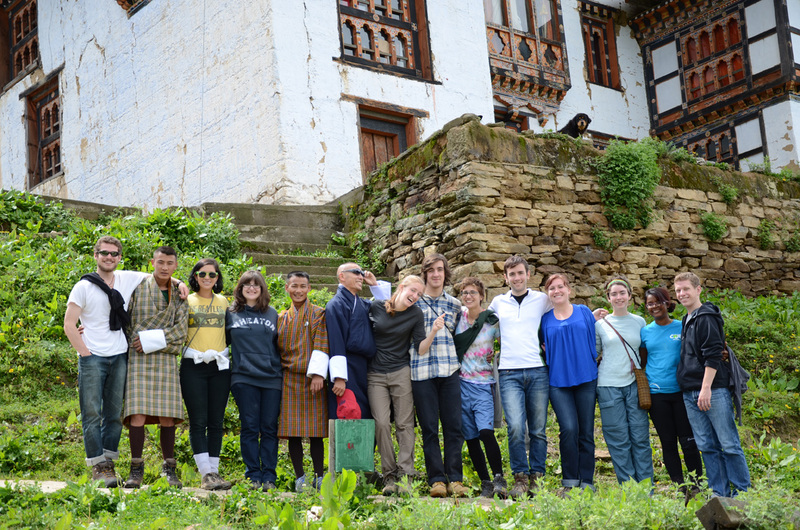 While we waited, we all walked up to a lhakhang which was only a ten minute walk up a side road, but unfortunately it was locked and we could not go inside; however, we still managed to have a photo opportunity in front of the lhakhang. 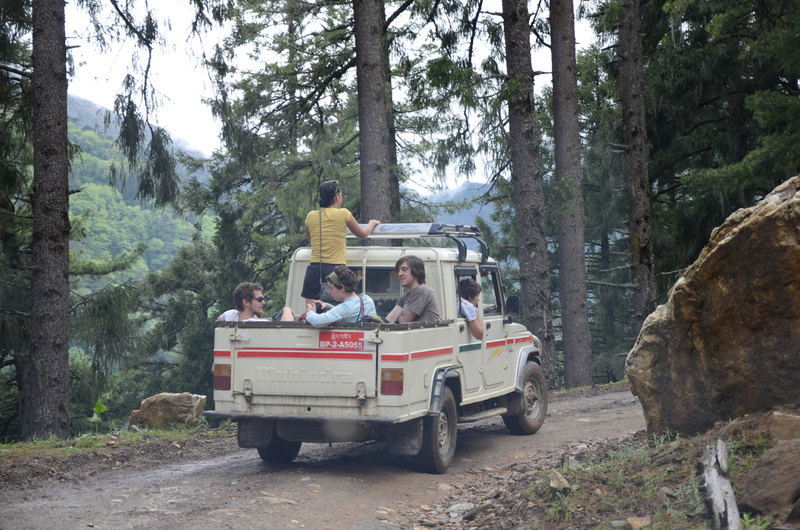 When we walked back down to Tsewang’s house, two pickup trucks were parked along the road in front of the house and Tsewang told us to grab our gear from the bus and load it all into the trucks. All of us, who are pretty proficient in math, saw the two trucks and then looked around at the fifteen bodies plus the two newly arrived drivers who would be driving us up the mountain to our campsite. Excitement filled most of us upon realization that about half of our group would be riding in the back of the trucks. 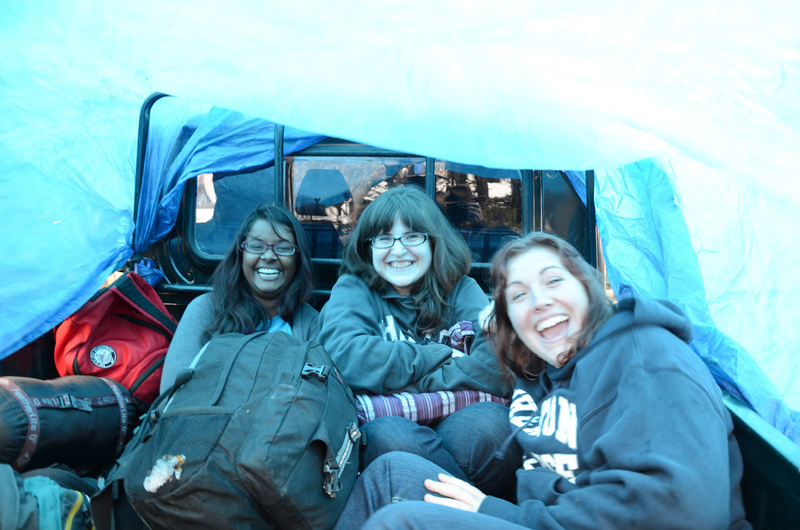 There were many more-than-willing volunteers to take on this task, and soon seven Wheaton students could be seen both standing and sitting in the back of two trucks riding along the very uneven and bumpy road until we reached the campsite at about 3,700 meters (12,139 feet). 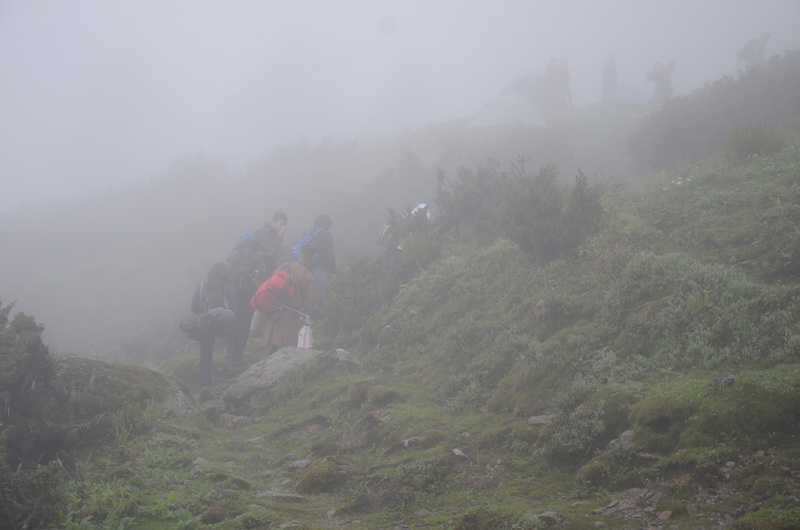 It was, for the most part, completely cloudy but occasional breaks in the clouds made it possible to see some spectacular views of the mountains around us. Our tents had already been pitched by the crew who arrived before us, including a curious looking tall and narrow tent which we learned was the tent covering a hole that was dug for all of our bathroom needs. 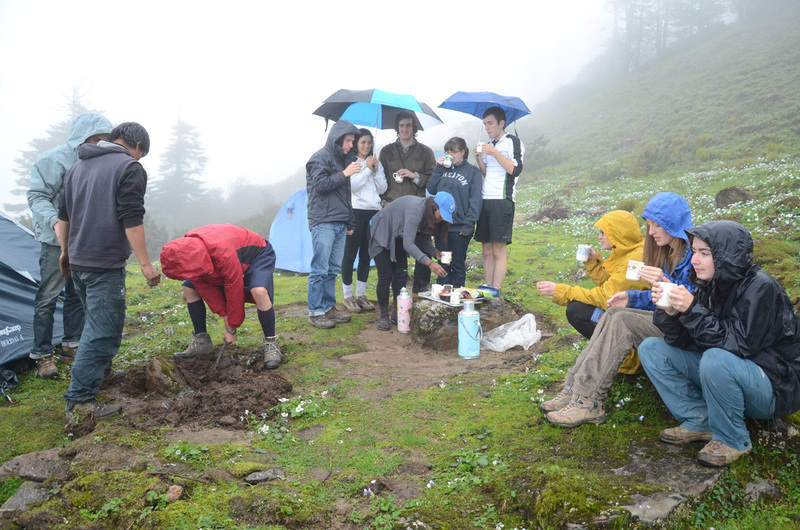 After selecting which tents would belong to whom, tea and biscuits were served. 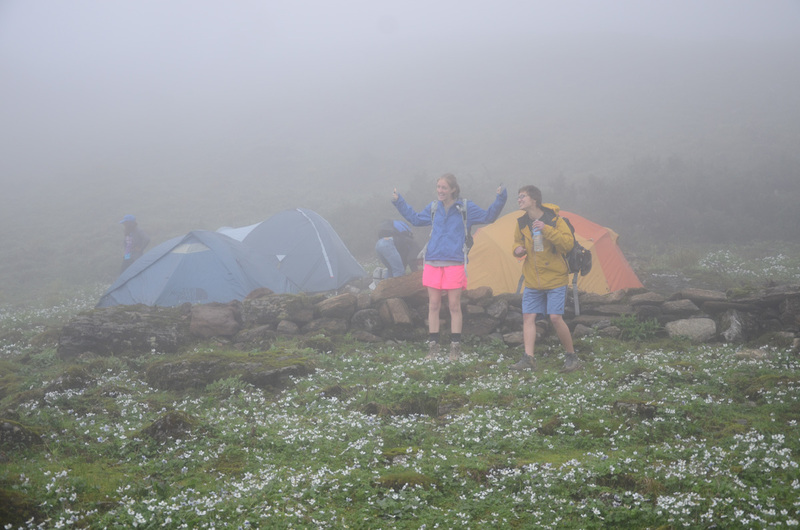 It had started to rain but some of us went to explore along the road while others relaxed in the tents until dinner time. Upon hearing that it was time to eat, we walked the little trek down to the mess tent, a familiar place from our weekend camping in Gasa. 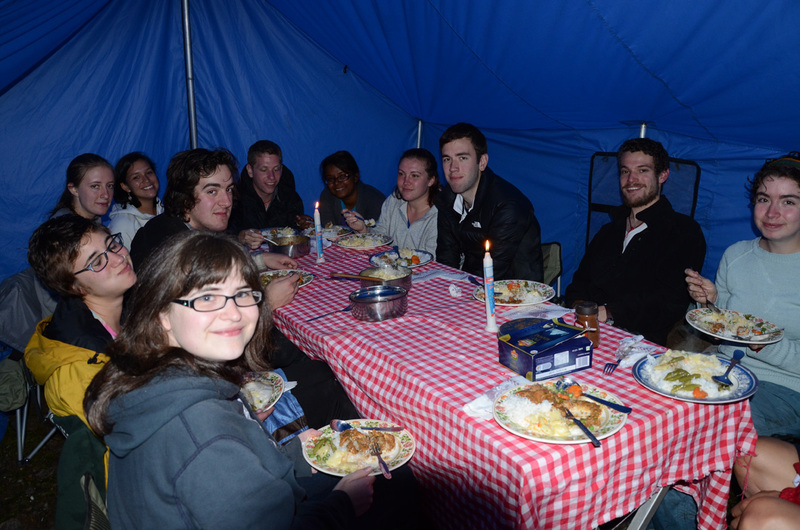 The dinner menu consisted of many familiar dishes such as red rice, mixed vegetables, and kewa datsi, one of our favorite dishes. There was also a new addition to the menu, goat (mutton), which was served in a thick sauce and was tried by all of the meat-eaters. We also wished Tsewang a very happy birthday even though there was no cake or candles to blow out. After sitting around the dinner table, we returned to our tents and chatted before getting a good night’s sleep in anticipation for our long hike the following morning.